Andrew Fekete arrived at the University of Liverpool in September 1972 to pursue his studies in Architecture. Just fourteen years later he would be dead, his life tragically cut short by an AIDS-related illness. Yet during these few brief years, he embarked on a remarkable voyage of self-discovery through his prolific painting and writing. Fekete was both fascinated and troubled by his inner life and the mental lives of others. He often went without sleep for days to induce a trance-like state in which to create his paintings. 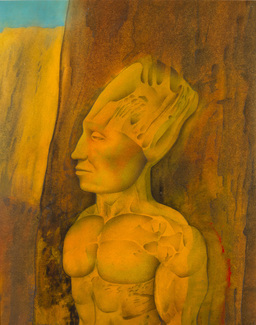 The images he produced are visual representations of the landscapes of his mind: mysterious, frightening and beautiful. The paintings became both self-expression and self-therapy. The Quest for Gold is an edited version of writings by visionary Andrew Fekete – a painter, architect, poet and writer, who died in 1986 from an Aids-related illness. Andrew, flâneur, walked the city; he was a man whose writings, to adapt the words of Baudelaire, serve as a mirror as vast as the crowd itself. This anthology, collated by his brother Peter, comprises key works from Andrew Fekete’s opus, and deals with his development as an artist, his visions and his experiment in Jungian alchemy – the intentional creation of visionary experiences to manifest unconscious archetypes to consciousness. The title is taken from an autobiographical novella that Andrew wrote in 1982, with extracts from his diaries also provided. The culmination of the anthology is the poem Punishment for the Transgressors in which Andrew confronts his impending death, thereby illustrating the connection between art and life. The work, which is open to multiple interpretations, is witty and entertaining, dramatic and engaging, full of deep sentiment and self-reflection. We journey with Andrew in his Quest for Gold that occurs against the background of his sexuality and his membership of the gay community. We see into the mind of a man undertaking an experiment in the exploration of what Jung calls the contents of the collective unconscious in an attempt at self-healing and expansion of consciousness.